It is only part of a much larger struggle to make history kinder by rewriting the past to glorify an imagined Hindutva future. On the eve of the 4th International Day of Yoga (IDY) 2018, there have been 7,694, 099 pledges made to make yoga an integral part of one’s daily life. While we can assume that this list of pledgers constitutes an international audience, requests made directly to the ministry of AYUSH for basic statistics remains unanswered. This makes it difficult to know, for sure, just how much international pledging there is. Regardless, people all around the world will be celebrating on June 21, and the days either side. However, there is an ambivalence to this pledge and to what the event entails, which we ought to look at it in more detail. This is particularly relevant when we think about how discordant groups from incommensurable social worlds come together through overlapping interests in yoga to create unlikely alliances. In legal/business parlance, a pledger is a debtor who pledges to pay the creditor/pledgee as security for a loan or obligation. While on the surface, this IDY pledge seems quite banal and trivial, there is a deeper level of obligation that is not readily cognisable to the unsuspecting and earnest "global yogi". There is a moral economy at play that, once making the pledge, potentially leads to unwitting, tacit support of a political theology the average global yogi might find particularly abhorrent. And, while JNU proffessor and columnist Makrand Paranjape gloats in a hagiographic register about the triumph of IDY as a soft power instrument that builds on the global appeal of yoga, there is no denying that yoga’s global popularity is facilitating the normalisation of Hindu supremacy, otherwise known as Hindutva. Hindutva is the nationalisation of religion. It literally means "Hindu-ness", and can be understood as "Hindu first"; which is the ethno-political theology at the heart of Hindu exceptionalism. As Sophia Ariel Bardi notes in her article, "How Hindutva recast multi-faith India as the Hindu homeland", the ideas of Hindutva are, basically, next-level Indian nationalism; which are central to the current government’s soft power-driven cultural expansionist agenda. International Day of Yoga is "yoga diplomacy" at work. It seeks to alter our perception of yoga, India, and Hindutva. Even though, for most unsuspecting global yogis, this pledge is nothing more than a personal promise and cosmopolitan commitment to make the self and world better. Yet, there is much more to this, as there is no coincidence, nor secret, to the integral component of the pledge; at least, for the insider. There are two philosophers, Jacques Maritain (1936) and Deendayal Upadhyaya (1965), both of whom wrote treatises, similarly titled, Integral Humanism. Here is the original version, in French, of Maritain’s monograph. And, here is Upadhayay’s digitised version on the BJPs website. While Maritain’s is a Catholic-oriented theology, Upadhyaya’s Integral Humanism is an evolution of an earlier Gandhian socialism. Also, Upadhyaya was the founder of the BJP’s forerunner — the BJS. Today, the BJP expects every BJP member to swear allegiance to the twin pillars of its political philosophy; namely, Integral Humanism and Hindutva. What these two integral humanist philosophies have in common is a general holism. This appeals to the individual concerned with being more mindful of one’s ecological footprint, so to speak. Globally, Integral Humanism is akin to a broader neo-pagan “religious environmentalism” and "dharmic ecology" movement, which, in its Indian iteration is decidedly "neo-Hindu" rather than genuinely "Vedic", regardless of this strained purport. However, just because yoga festivals aim to create utopian spaces, there are too often unintended ecological consequences of the eat, pray, pollute form that directly result from yoga-inspired pilgrimage tourism. Take, for example, the Art of Living guru, Sri Sri Ravi Shankar, whose own "Promise to Yoga" will do little to repair what the Delhi High Court describes as an ecological disaster, for which his yoga festival is solely responsible. Just like the relaunch of "Incredible India 2.0", the rebranding of Hindutva involves euphemising it through the synonymous phrase: Integral Humanism. This is an attempt at camouflaging the harder, right-wing position of Hindutva and replacing it with an ambivalent and digestible Integral Humanism. This is a conscious diplomatic strategy to aid easier proselytisation of English speakers and sanitise an insidious political ideology; which the Indian government’s Ministry of External Affairs (MEA) published an e-book of Upadhyaya’s Integral Humanism. Regrettably, the link no longer works. However, Siddharth Varadarajan of The Wire questions why this ruling party is allowed to misuse governmental institutions and public funds to publish and distribute propaganda in an attempt to give the ideology respectability, particularly, internationally. Writer and essayist Gino Battaglia explains that: "Whereas Integral Humanism is India’s universal mission, it is the completeness of a civilisation realised over millennia, and at the same time the remedy to rid humanity of its evils. Humanism seemed to oppose any form of obscurantism, pointing at a truth which is deeper than any religion or any ideology. That is Dharma. Notwithstanding such humanism contains the presuppositions of a new intolerance and sectarianism." Dharma is a very popular concept within global yoga. It is found within most, if not every, yoga teacher-training manual. All too often, prescriptive discussions around perceived legitimacy of what should constitute yoga, the yoga body, or the yogic "way of life" fall into the same binary that supporters of Hindutva use to shut down criticism. Something or someone is either dharmic, that is, legitimate, and to be supported; or adharmic, that is, illegitimate, and to be shunned. And, while it might mean reasonably the same thing to different people (that is, a "way of life" or "religion"), its applications can vary quite considerably. For example, the Way of Dharma project, which is organised by the Srijan Foundation, claims that it "is a platform for spreading dharmic traditions and religions. Our goal is to make Hinduism missionary". This organisation makes no attempt to hide its Hindu nationalism, particularly when there is a video in the bottom right corner of the homepage, titled, "Hindu Dharma and Nationalism"; which you can watch here; although, it might help if you know Hindi. With this now in perspective, it becomes clearer what global yogis are actually pledging themselves to; and, what the moral obligation involves. Whether a global yogi is aware of it, or not; every pledge that is made lends support to the project of legitimising Hindutva. 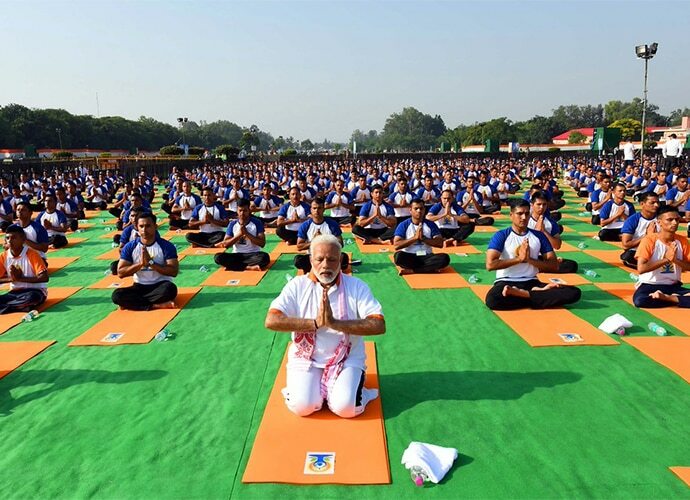 Narendra Modi’s integral pledge demonstrates how the politics of Hindutva is reconstituted and made more palatable for consumption through the imaginative consumption of yoga-inspired lifestyles. And, while many promises have been made, the perceived power of yoga is part of a much larger economic problem that sees millions out of work. Specifically, Narendra Modi’s promise to use the yoga industrial complex to boost jobs in Uttarakhand, where the self-styled "home of yoga" is in Rishikesh, seems to be falling short of the mark. Perhaps, all these promises of yoga’s ability to create employment, prosperity, wellness and dharmic ecological utopias falls short. Perhaps, instead, the primary aim of IDY is to further the stated aims of Hindutva, which it’s primary objective is to create a Hindu theocratic state by 2020 and then world by 2030. This is part of a national conglomeration of disparate ethno-nationalist groups who share the same aim. And, of course, while it is true that many suggest that IDY is celebrated on the summer solstice for symbolic reasons, the dark side of this moon is that there is also no secret as to why June 21 is chosen for IDY. It is no coincidence that it falls on the same day as the death anniversary of Keshav Baliram Hegdewar, the founder of the Hindutva-inspired Rashtriya Swayamsevak Sangh (RSS) in 1925, which is the ideological parent to the BJP and Narendra Modi, who is also a life-long member. IDY is only part of a much larger struggle to make history kinder by rewriting the past to glorify an imagined Hindutva future. However, if in the end, neither Narendra Modi’s pledge, the Art of Living’s promise, nor a future pan-global Hindutva theocracy, appeals; then, there is always LuLu Lemon’s pledge that one could get behind. The author is a JSPS Post-Doctoral Fellow at the Graduate School of Global Environmental Studies, Kyoto University, Japan; a Research Associate at Nanzan Anthropological Institute, Nanzan University, Japan; and a Visiting Fellow at the South and South-East Asian Studies Department, Australian National University, Australia.